Ankle sprains are one of the most common musculoskeletal and sports-related injuries, constituting nearly 25% of all musculoskeletal trauma cases and almost 40% of all sports-related trauma cases. 40%-50% of these case have reported to have long term residual symptoms with almost 20% of acute ankle sprains developing chronic ankle instability. Individuals with chronic instability often report recurrent sprains and 'giving-way' sensation at the ankle joint, a condition clinical referred to as Functional Ankle Instability (FAI). Several clinical tests can be used to assess FAI and the respective ligament involved in the acute sprain or chronic instability. CFL is an extra-articular component of the complex. Its function is to resist torsion and inversion stresses in a dorsiflexed foot. The PTFL resists posterior movement of the talus. It is the strongest and least injured part of the complex. 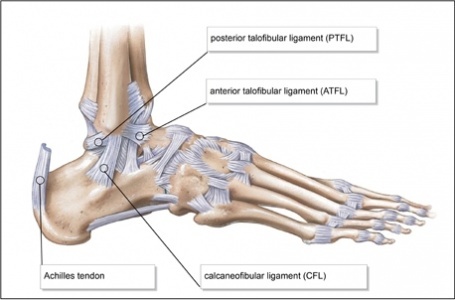 Injuries to PTFL usually occur in severe ankle sprains which also involve the ATFL and CFL. The deltoid ligament is the only ligamentous complex stabilizing the medial side of the ankle. This complex is composed of two layers: superficial and deep. 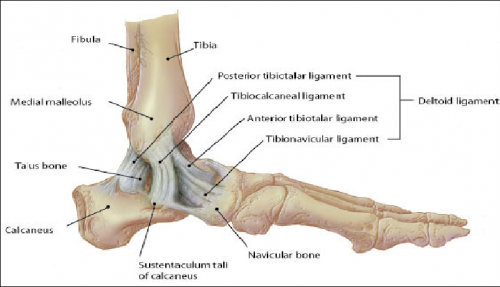 The superficial layer includes the tibionavicular, tibiocalcaneal and the posterior talotibial ligament. The deep layer is composed of deep posterior talotibial and deep anterior talotibial ligament. The deep layer has greater contribution to the stability of the ankle. The deltoid ligament as a whole has a dual function of providing stability to the talotibial joint as well as transferring forces between the tibia and tarsus. It fixates the tibia above the talus and restricts the talus from shifting into a valgus postion, translating antero-laterally or rotating externally. The medial side of the ankle is considerably stronger than the lateral side. Injury to the medial ankle may even lead to fracture of the medial malleolus without a significant sprain to the deltoid ligament. It is used to assess the integrity of the ATFL based on the anterior translation of the talus under the tibia in a sagittal plane. Procedure: The patient is in supine lying or sitting position with the knee in flexed position to relax the calf muscles and prevent the patient from resisting the examiner. One hand of the examiner stabilizes the distal tibia and fibula while the other hand holds the calcaneus maintaining the ankle in a neutral position or 20 degrees of plantar flexion. A translatory force is applied on the calcaneus pulling it anteriorly while the tibia and fibula are pushed posteriorly. The test is performed on both sides and the two sides are compared. Excessive anterior translation of the talus on the injured side in comparison to the uninjured side indicates a positive test. A translation of more than 4-5 mm on the injured would indicate a tear of ATFL. Procedure: The patient is positioned in sitting or supine lying with the knee in full extension. The examiner stabilizes the distal leg with one hand while the other hand holds the heel with the ankle in neutral position. The heel is inverted with respect to the tibia. It is important to hold the talus and calcaneus as one unit to prevent excessive subtalar movement. Pain in the area of the ligament or a sensation of clunk would indicate a positive test. An outward translation in excess of 5 degrees on the injured side compared to the uninjured side, or a spongy or indefinite end feel indicate a complete tear of CFL. It assesses the integrity of the deltoid ligament and is also know as the Eversion Talar Tilt test. Procedure: The patient is positioned similar to the Inversion stress test. The examiner everts and abducts the heel while stabilizing the distal tibia. The test is performed on both the sides. An increased laxity and pain on the injured side in comparison to the uninjured side would indicate a positive test. A spongy or indefinite end feel is indicative of a complete tear. 1. Sensitivity values for the Anterior Drawer test have been shown to be between 32% to 80% while specificity value has been reported as 80%. 2. A positive drawer test done 5 days after the injury, has been shown to be more sensitive and specific than the test done withing the 24-48 hours. 4. In acute injuries, the eversion stress test may be of limited clinical value. However, the accuracy of the test when done after 5 days of injury increases to 96% sensitivity and 84% specificity. ↑ Ross SE, Guskiewicz KM, Gross MT. Assessment tools for identifying functional limitations associated with functional ankle instability. Journal of athletic training. 2008 Feb;43(1):44-50. ↑ van Dijk CN, Lim LS, Bossuyt PM, Marti RK. Physical exam is sufficient for diagnosis of sprained ankles. Journal of bone and joint surgery. 1996;78(B):958-962.